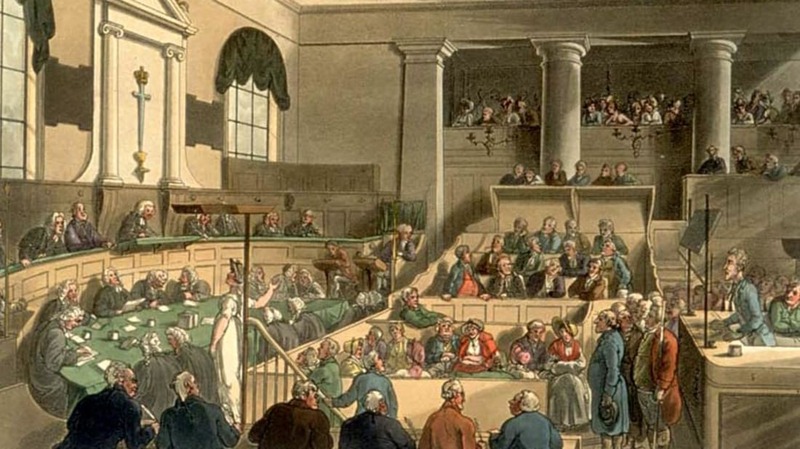 Below is an introduction to the records of the Old Bailey—and the glimpses they provide into what life was like for alleged criminals centuries ago. The Verdict: Not guilty. As airtight as the evidence was, urine-induced witch shriek and all, Kent had a solid defense. "But she producing Evidence that she had lived honestly, and was a great pains-taker, and that she went to Church, with many other Circumstances, the Jury found her not Guilty." The Case: Mall. Floyd was noted in the casebooks of the Old Bailey as having discovered a “particularly remarkable” kind of crime. The clothing belonging to the wealthy of the era would have been made of the finest lace and cloth—and worth a great deal of money. The easiest way to snag some of these golden threads? By taking them from small children, of course. The Verdict: Guilty. Mall. Floyd confessed and was sent to Newgate prison, but not for long: “Having been often a distressed Lady before in that Inchanted Castle” (it seems as though court reporters were allowed to have a sense of humor back in the day! ), she was sentenced "to be Transported to some of the Plantations beyond the Seas." The Case: John Cockerell, a fairly well-to-do man in his 60s, is said to have frequently bothered a female friend of his about finding him a wife. A rich wife. He turned down many matches that did not meet his high standards. So when his friend Hester Gregory, apparently sick of his pestering, introduced him to “a very agreeable young Lady that is lately come from Barbadoes”—and who supposedly owned a vast plantation bringing in enormous income—he married her within two days’ time. Though there was no real way to ensure her story checked out—remember, this was pre-Catfish—he was assured by Gregory and her pals that he had stumbled upon a goldmine, and that he better grab her before her many other potential suitors did. And so they married and spent the night together, thus cementing the marriage according to the laws of the day. Unsatisfied, Cockerell tried to gather evidence that his wife was a woman of ill-repute, but there was none. He then tried to bribe her into a divorce, promising her a small sum if she complied, which she, of course, would not. That would have made her a woman of ill-repute. Elizabeth insisted she was innocent—never mind that the stabbed man had crawled to his doorway, called his neighbor over, and “then imbracing him, cryed out dear Countryman, my wife has stab'd me with a knife I borrowed of you, which words he reiterated 3 or 4 times, and then sunk down dead.” So yes: she was lying. But Elizabeth's real problem was that she had murdered her husband. In 17th-century England, the husband was viewed as the king of the household. To kill a king, of course, isn’t just murder; it’s treason. Thus, killing one's husband resulted in a charge of “petty treason.” Suffice it to say no merciful noose awaited Elizabeth Lylliman. The Case: Muggleton started his adult life as a tailor, eventually deciding the trade didn't suit him. For his second career, he decided to declare himself a religious figure, claiming he wielded more earthly power than God himself. Muggleton proclaimed that "the whole power of Witnessing, Blessing, and Cursing, devolved into his hands, which he as impiously practised upon the least affront or opposition; pronouncing persons damn'd by their particular Names, blasphemonsly adding, That God, Angels, or Men could not afterwards save them.'" Verdict: Guilty. To the heartbreak of devout Muggletonians everywhere, Muggleton was sentenced to “stand three days in the Pillory at three the most eminent places of the City, with Papers shewing his Crime.” Even more insulting: his heretic writings where to be chopped into three chunks and burned over his head during each pillorying. Muggleton was also sent to jail until he could pay his staggering 500 pound fine. We can only imagine the horrific punishments awaiting his persecutors once they entered Muggleton damnation in the Muggletonian afterlife.